The last time any new machine was calibrated it may have been thousands of miles away from its point of use. We test and adjust all machines before dispatch to ensure best performance. Variations in location can affect accuracy therefore for best performance a machine should be calibrated at its point of use. We have the technical capability to install and calibrate machines and issue a UKAS certificate to the ISO 17025:2005 standard. Alternatively we can issue certificates fully compliant to ISO 9001:2000 management systems. A mandatory figure for ISO 17025:2005 and an essential for accurate precise weighing - we include this on all ISO national traceable certificates. 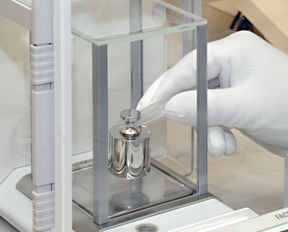 We are accredited by UKAS for on-site calibration of weighing machines laboratory. 0459. This is the most the most stringent technical standard. We are accredited and calibrate from 500Kg to 0.000001g. We can also issue UKAS certificates for portable balances in our workshop. Our unique computerised loggers, can issue certificates immediately! Electronic units require specialist knowledge and test equipment - We have invested in these areas extensively for minimal failures and best performance!! We supply reliable efficient on site service and calibration from factory trained engineers experienced in precision weighing, we can calculate minimum weight for regulatory compliance. All engineers are equipped with full compliment of calibration weights to UKAS recommend accuracy and specialist tools for the task envisaged. We can check customers test weights and issue certificates, directly compared against national standards.